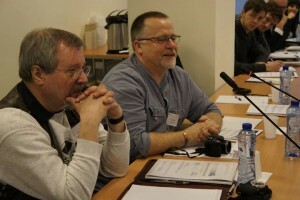 MAG Ireland was at the heart of the debate during two days of presentations and discussions at the European Motorcyclists’ Forum with other motorcycle rider organisations, motorcycle experts, policy-makers and stakeholders in Brussels. 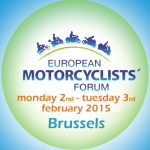 The forum, organised by the Federation of European Motorcyclists’ Associations (FEMA), presented the outcome of the 3 year RIDERSCAN project which was co-funded by the European Commission. Day 1 was broken down into five sessions which allowed workshop discussions, with MAG Ireland inputting with the participants. 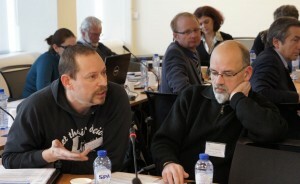 The second day of the forum moved into the European Parliament where the RIDERSCAN project was presented again with the addition of the opinions from the first day’s workshop discussions. The question steering the discussion was – How can we tackle motorcycle safety challenges for the next decade? The parliamentary session apart from being used to obtain views on the outcomes of RIDERSCAN also looked at the mid-term evaluation of the European Commission Road Safety Policy Orientations 2011-2020. The panel for the session consisted of Szabolcs Schmidt (Head of the Road Safety Unit, Directorate-General for Mobility and Transport (DG MOVE) of the European Commission); members of the European parliament Inés Ayalá-Sender and Wim van de Camp; FIM The Fédération Internationale de Motocyclisme CAP Public Affairs Commission Director Jesper Christenson and FEMA General Secretary Dolf Willigers. During the morning in the parliament it became clear that the huge amount of information the RIDERSCAN project has generated will be very useful for the European Commission, and Mr. Schmidt expressed his gratitude for this, saying that the outcomes of the project were very useful and would certainly be taken into account in the mid-tern evaluation of the European Commission Road Safety Policy Orientations 2011-2020. Mr. Van de Camp and Ms. Ayalá-Sender saw room for improvement of the Road Safety Policy and emphasized the need to use the information of RIDERSCAN in this. They also foresaw a growing role for powered two wheelers (PTWs) in future mobility. Mr. Van de Camp then invited the motorcycle community to give him input for the mid-term evaluation of the European Commission Road Safety Policy Orientations 2011-2020 in the European Parliament. Jesper Christensen emphasized the need for better training and licencing; he drew attention to the fact that the present Driving Licence Directive has discriminatory effects on women and smaller men and asked that this issue be addressed. He also asked for better infrastructure and standards for barriers that will take riders into account. Dolf Willigers stated that the use of powered two wheelers was part of the solution for present and future congestion problems and therefore using a PTW should be made safer. He expressed the hope that the outcomes of the RIDERSCAN project and the willingness of the European Commission to use them would contribute to this. Finally Pierre van Elslande, Chairman of the ITF Working Group, presented some of the outcomes of the OECD/ITF – Organisation for Economic Cooperation and Development/International Transport Forum Motorcycle – safety report entitled “The Safety of Powered Two Wheelers”. In his presentation regarding a growing role of PTWs in global mobility, Mr. Van Elslande referred a disproportional number of casualties of riders and the need to take action on this. The OECD/ITF report will contain recommendations to enhance motorcycle road safety and FEMA/FIM/FIM Europe have put together a combined response to the draft version of this report. 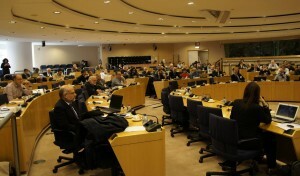 MAG Ireland was represented at the European Motorcyclists’ by representative Trevor Baird who has the unenviable task of sorting through the complex issues of European issues of technical, political and representation to the legislators, other motorcycle rider organisations, motorcycle experts and stakeholders in Brussels. However in simple terms that means letting riders continue to ride and enjoy motorcycling – the hard work to let you throw a leg over your bike and ride!.